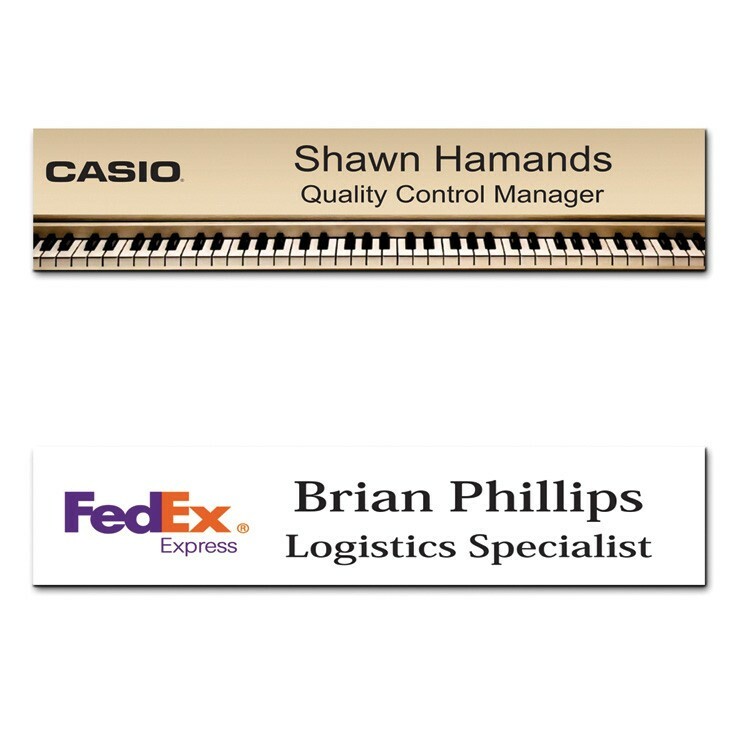 This full color Apollo name badge is one of our best selling badge styles, and with good cause! 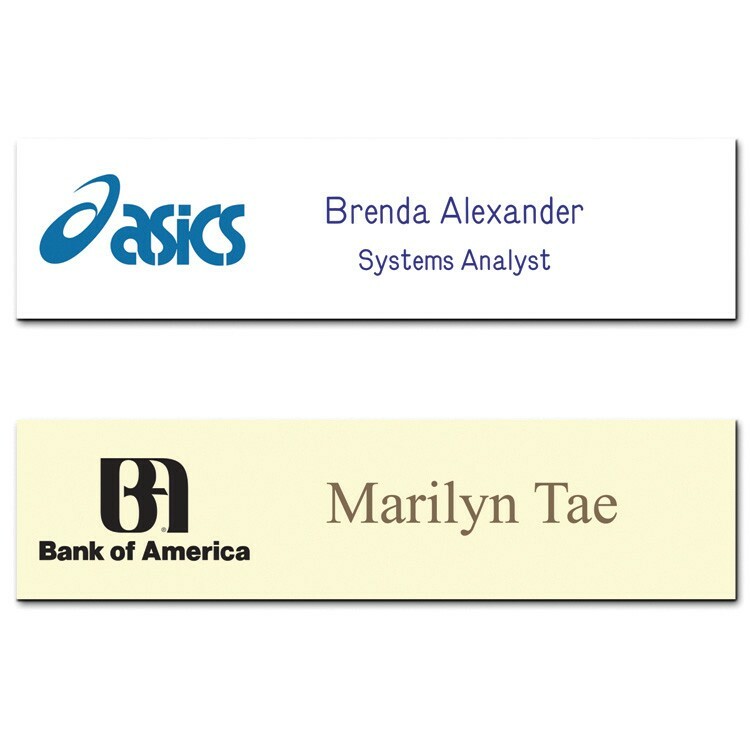 These Apollo name tags are printed in high definition full color graphics, with a protective laminate applied for a unique combination of great looks and super durability. 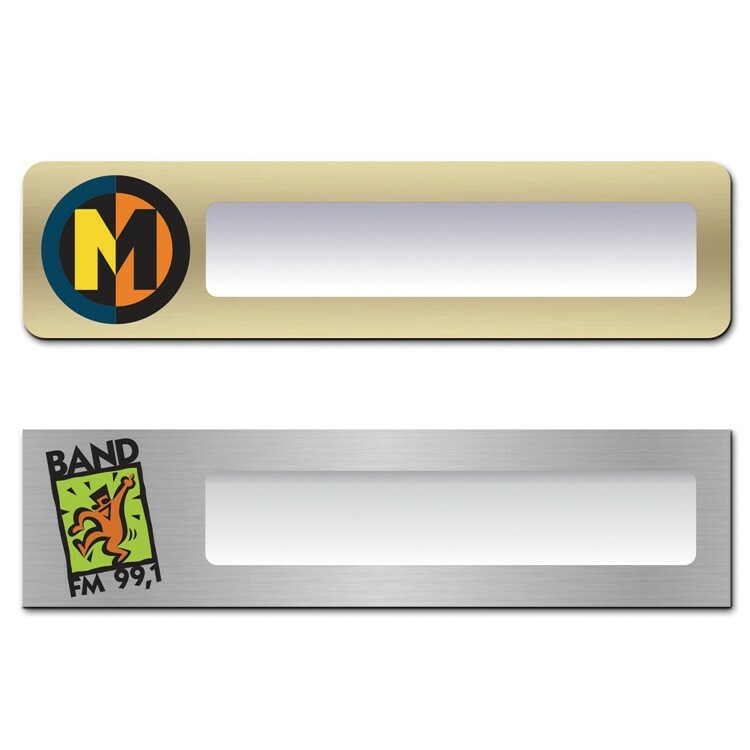 Cost includes digital 4-color process, 3 lines of personalization, round or square corners, and a pinback attachment on 1/16” thick white plastic.Other attachments, including magnet backs (make it a magnetic name badge), can be obtained at additional cost.The Vault online release program is available, allowing you to release personalized badges as few as 1 at a time. If Cyclops can get by without an eye, you can get by without personalizations. Choose from a variety of stock sizes. 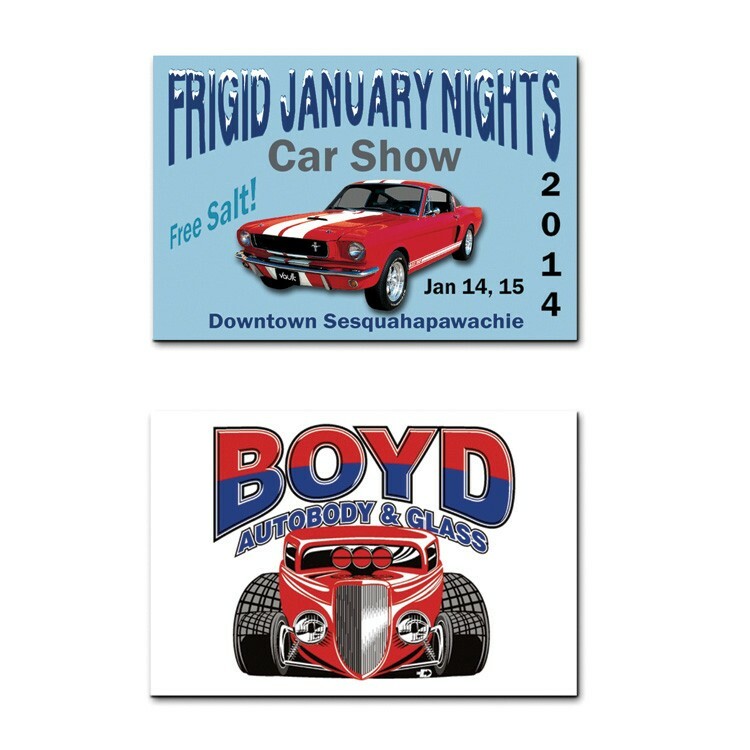 These durable non-personalized badges are full color, die cut from .030 material, are supplied with a pinback and are bulk bagged. Consult factory for other attachment options. You won’t blink at these prices! 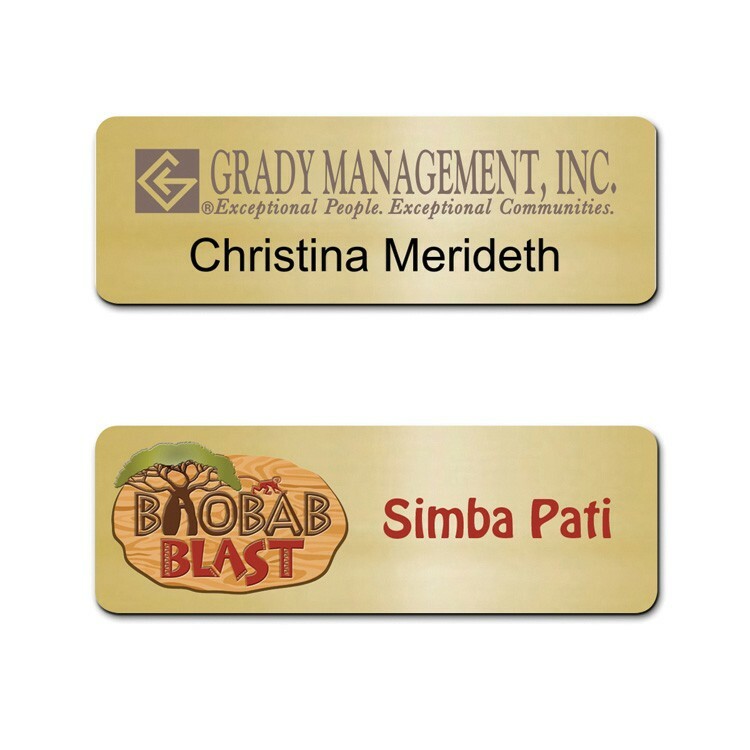 Your odyssey for an inexpensive non-personalized badge ends here. You’ve hit a Homer with the Cyclops. The Orion combines the super sharp full color imprint of the Plato badge with a fancy silver or gold finish, making it metallic and reusable! 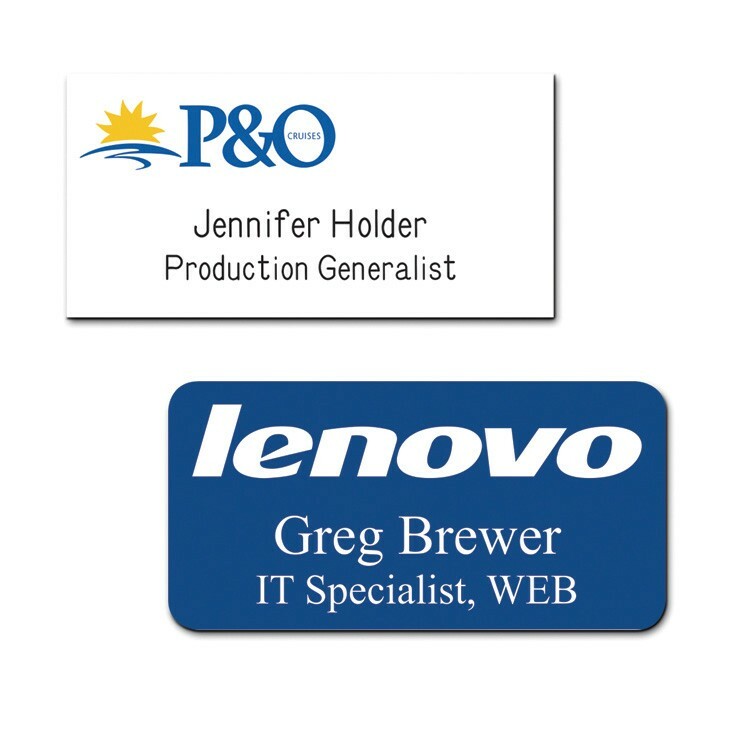 This badge comes with insert sheets for easy personalization, so when you lose another employee because of your obvious disregard for her welfare, the badge stays with you! Just pop in another insert sheet. Severance Shmeverance. 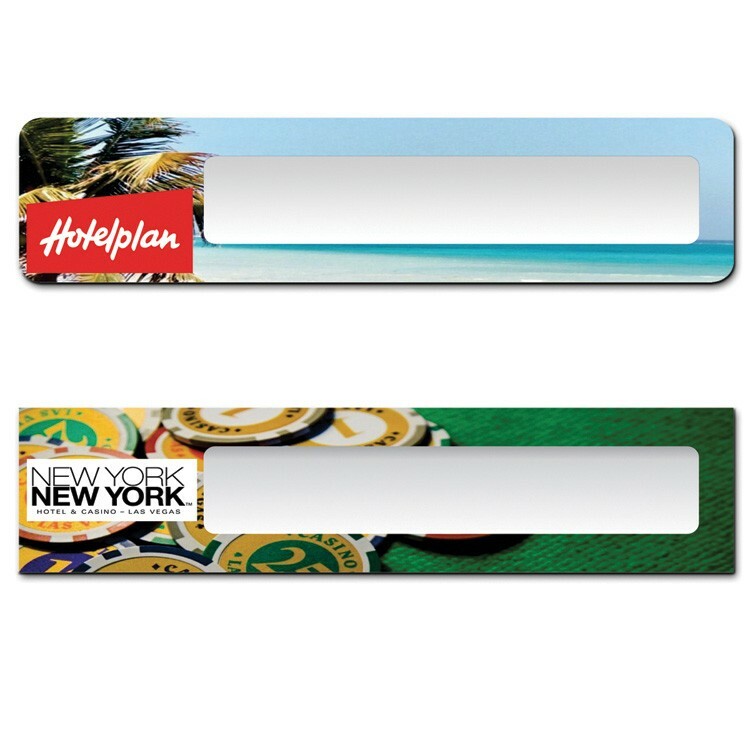 Perfect for travel and other events, like your “staycation”, these distinctive bag tags have a full color digital high definition imprint on .030" white plastic with a write-on address panel on the back side. Also included with this luggage tag is a clear loop strap (available in 4 other colors) that ships unattached and bagged separately. Other sizes as well as plastic strap attachments are also available. Make your bag stand out on the carousel! This full color Ares badge is a great way to show a vibrant logo, but mostly, it''s a great way of saying, "I''m wearing a badge, and it''s got my name on it". 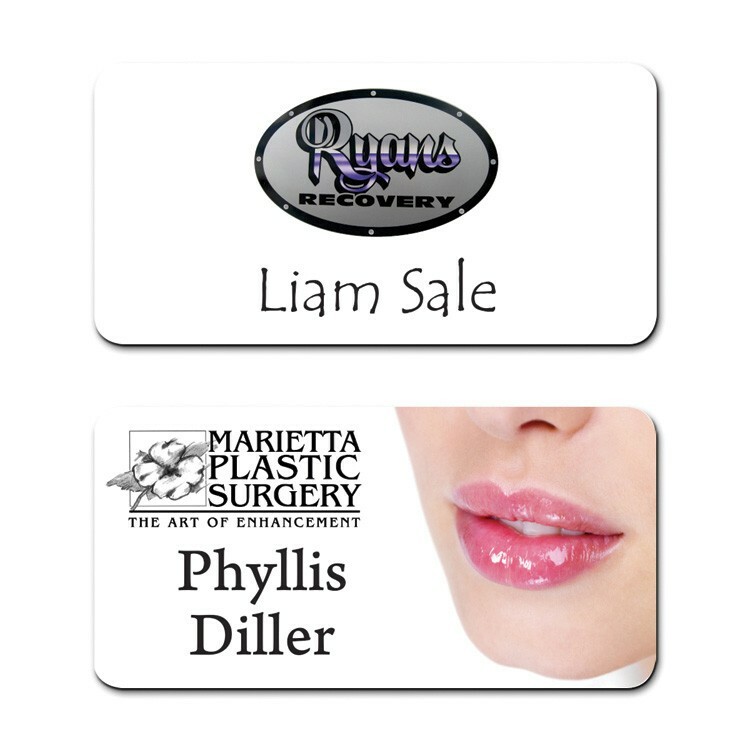 Includes digital 4-color process, up to 3 lines of personalization, square or round corners and a jewelers pinback attachment. 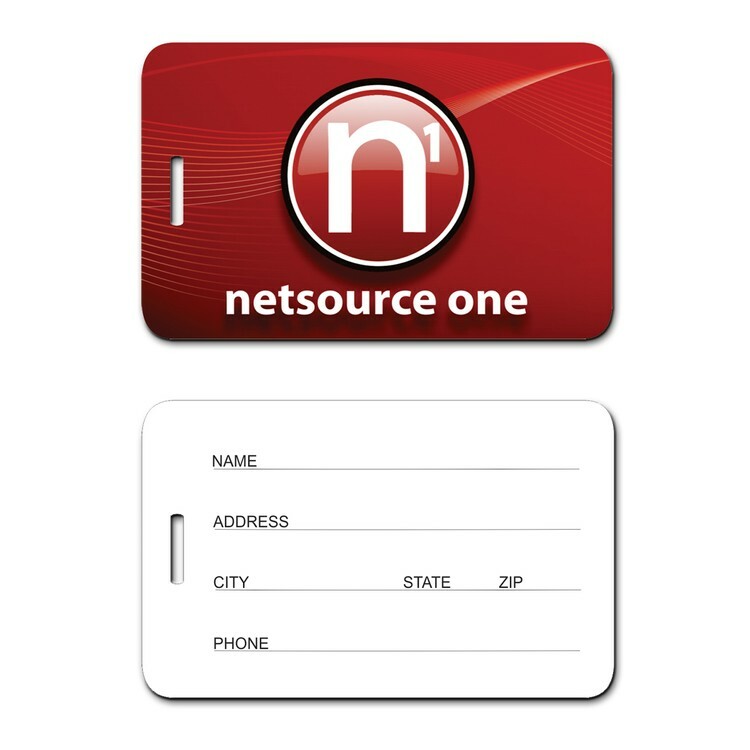 Made with .030” thick white plastic with a credit card feel. 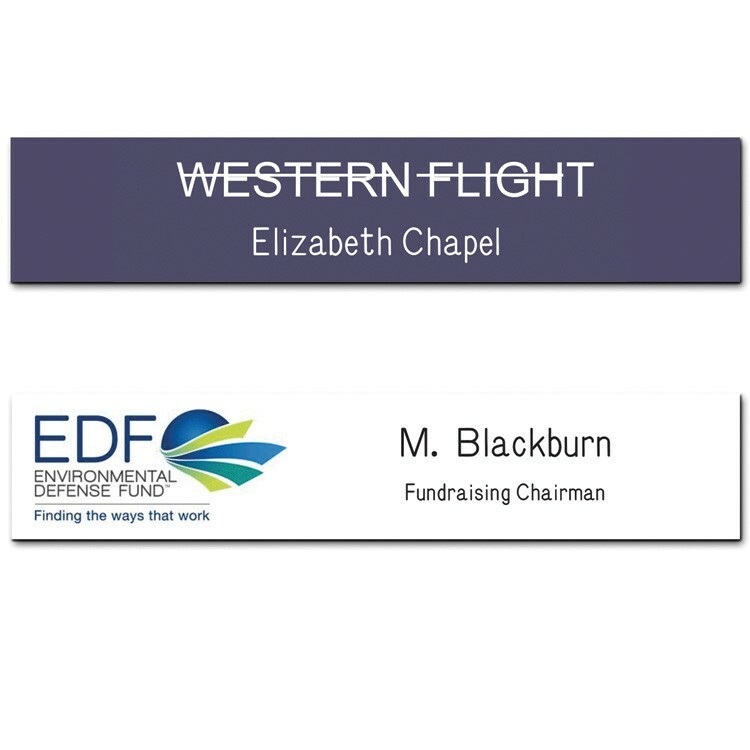 Glossy lamination is used to protect and show off this colorful name tag! 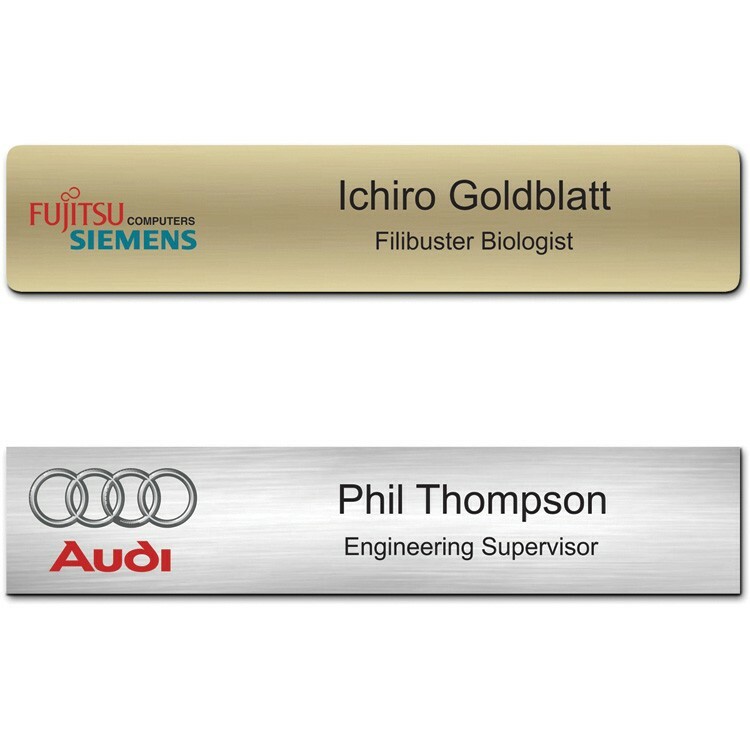 Other attachments are available including magnet backs, at an additional cost.The Vault online release program is available, allowing you to release personalized badges as few as 1 at a time. 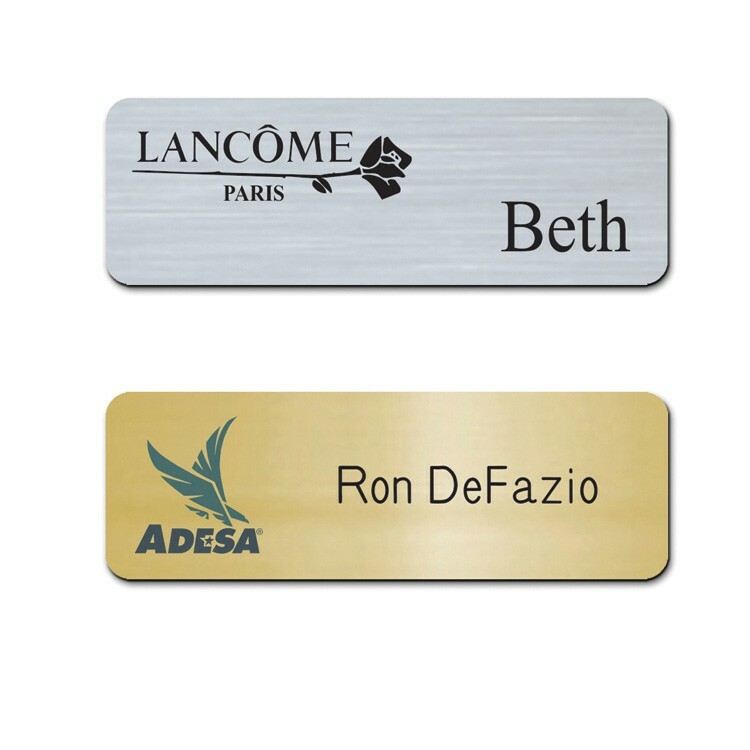 If you’re looking for a sizzling screen printed and engraved name badge on a non-metallic plastic, your search is over. If you’re looking for your shih tzu Schubert, we can’t help you. 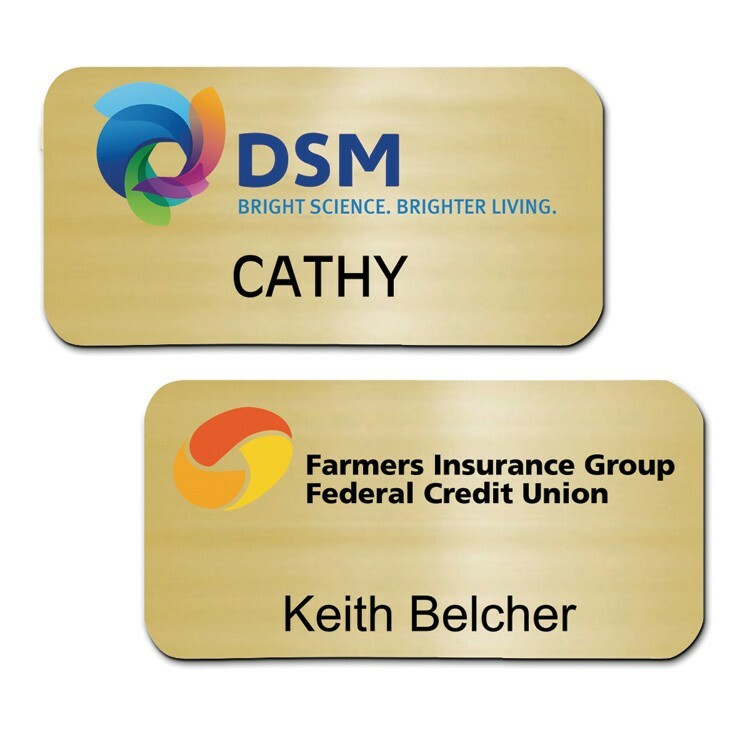 We start with your choice of a 2-ply non-metallic plastic, screen print your logo, then engrave a line of personalization on it.These badges come with our standard pin back attachment. 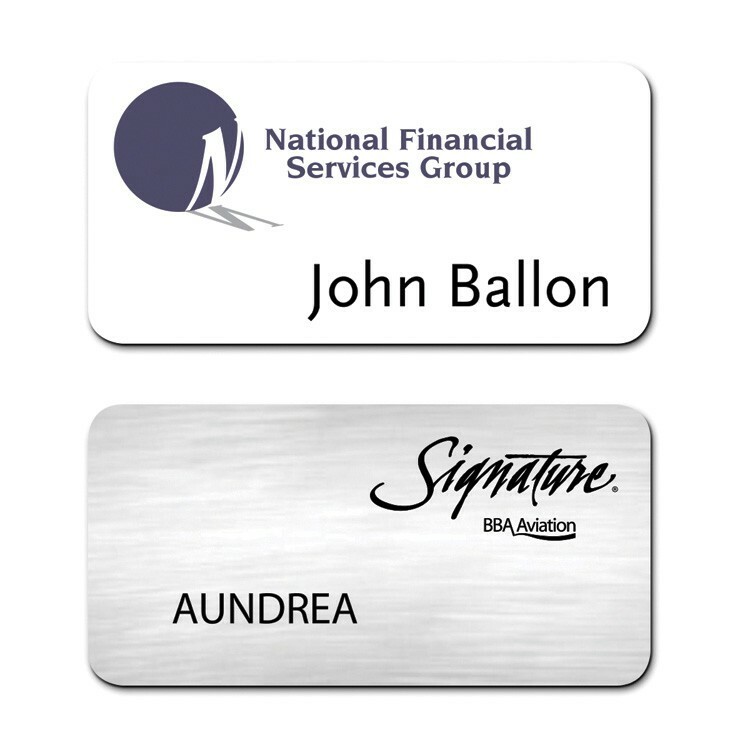 Additional lines of personalization and attachments, including magnet backs, are available at additional cost. 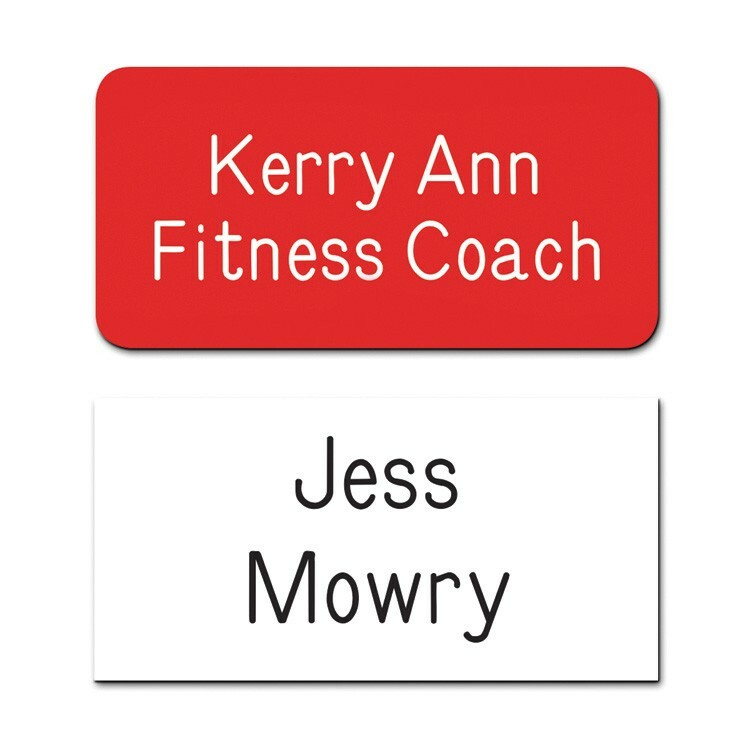 The Vault online release program is available, allowing you to release personalized badges as few as 1 at a time. 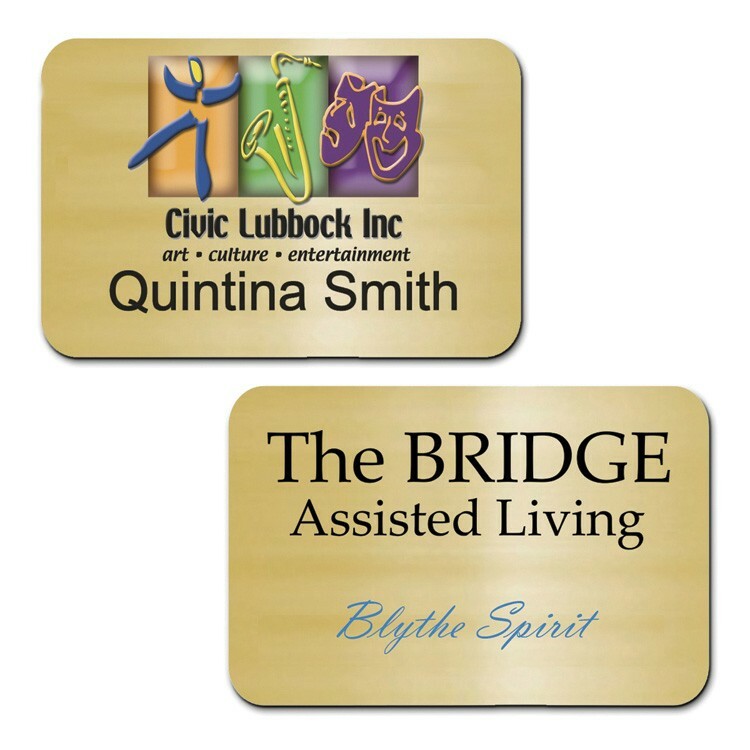 The Plato badge is full color and arguably your most stunning option for a reusable badge. 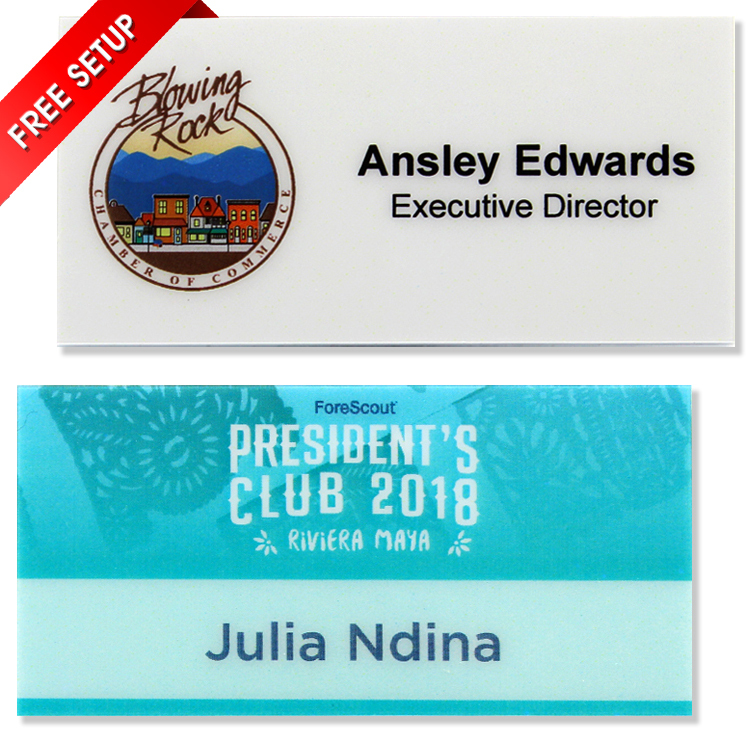 Printed with a clear window to allow you to simply slide in a paper insert with a name printed on it, so at least when you finally can that selfless volunteer, you can get his badge back! 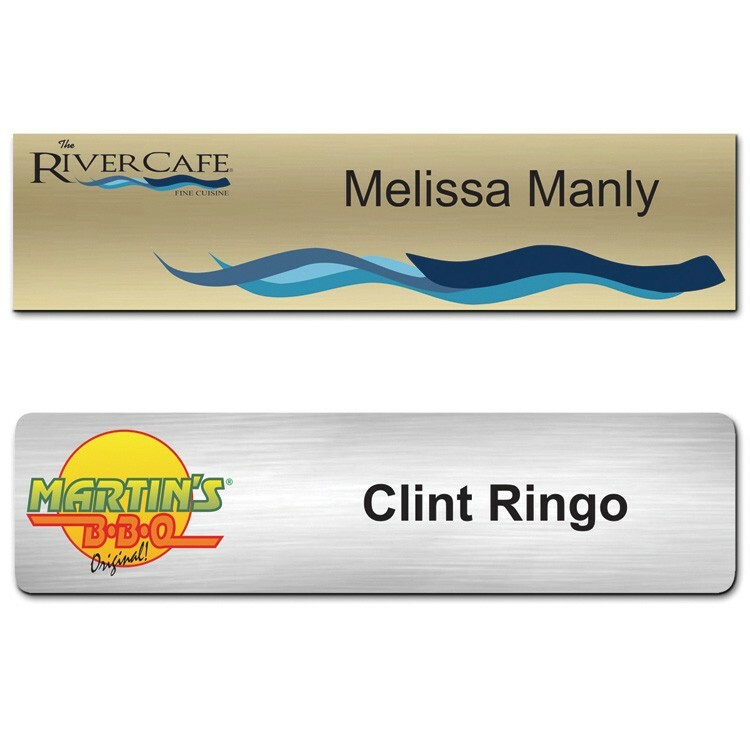 These Marathon Plastic name badges are popular with a screened logo and engraved name on your choice of 1/16” thick gold or silver metallic plastic. Made in the USA (not Kenya), the Marathon includes 1 stock color imprint, 1 line of personalization, round or square corners and jewelers pin. 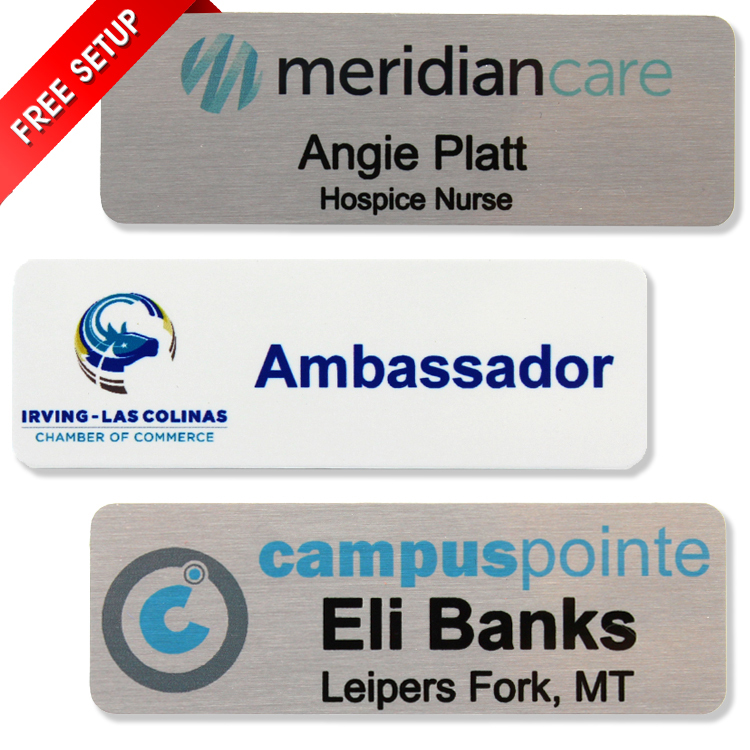 Additional imprint colors, lines of personalization, attachments, including magnet backs and are available at additional cost. The Vault online release program is available for these badges. 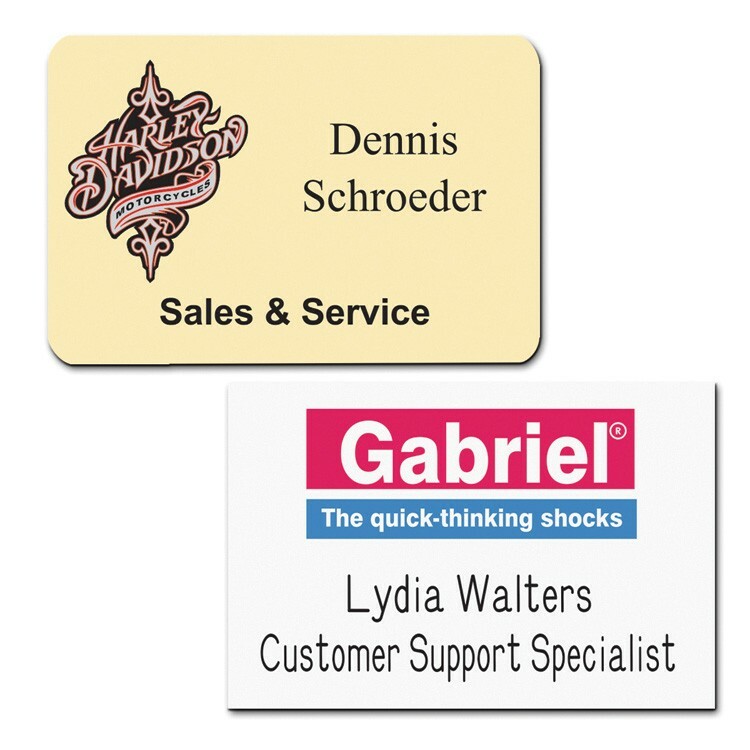 This full color Apollo name badge is one of our best selling badge styles, and with good cause! 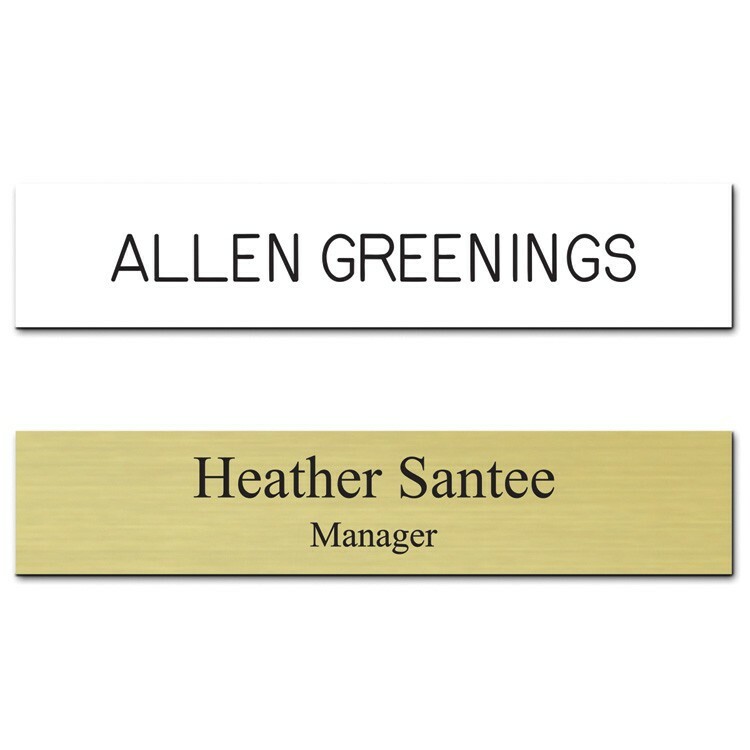 These Apollo name tags are printed in high definition full color graphics, with a protective laminate applied for a unique combination of great looks and super durability. 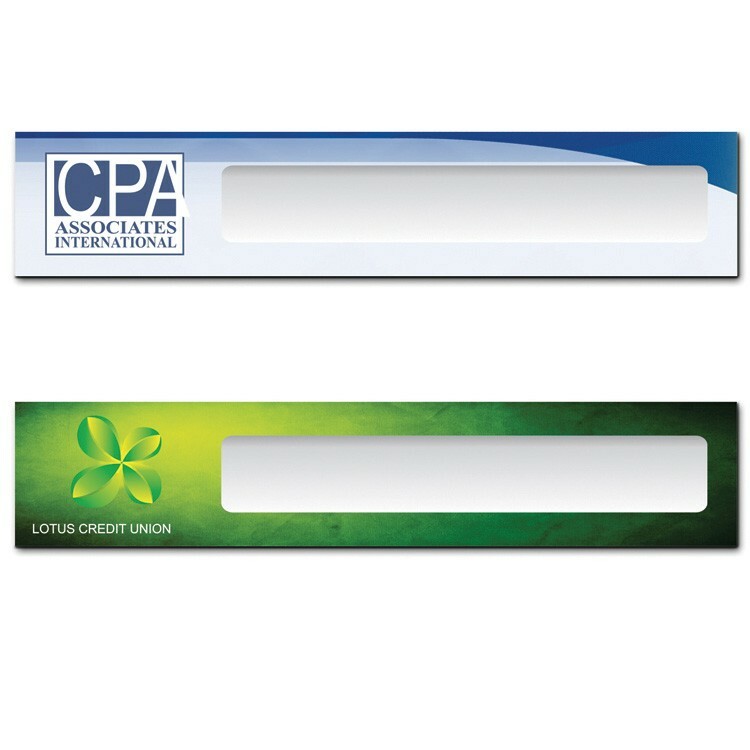 Cost includes digital 4-color process, 3 lines of personalization, round or square corners, and a pinback attachment on 1/16” thick white plastic.Other attachments, including magnet backs, can be obtained at additional cost.The Vault online release program is available, allowing you to release personalized badges as few as 1 at a time. 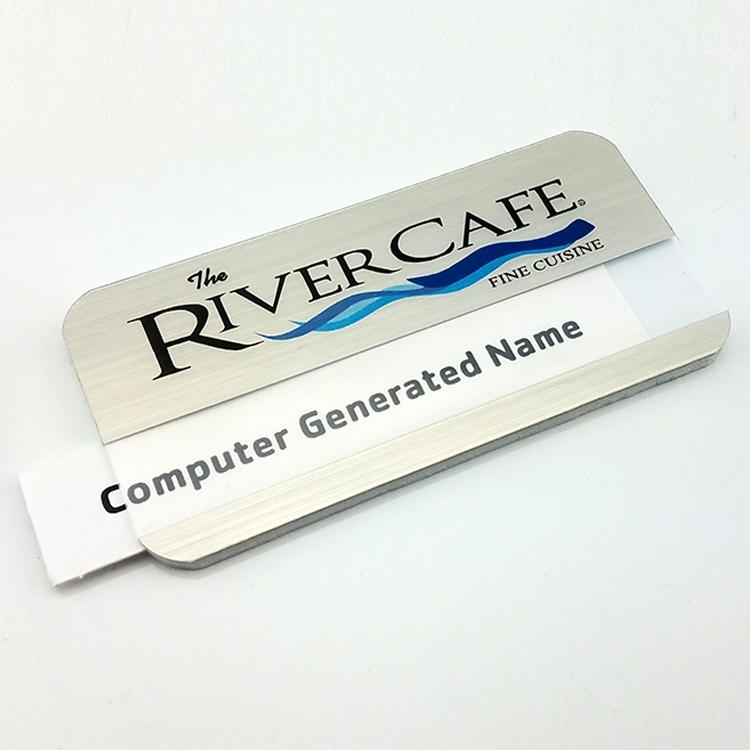 In a world full of “full color this”, and “flashy that”, sometimes a good ol’ fashioned engraved piece of plastic is exactly the simple, yet elegant piece you need. Just like Mom used to make. Choose from your choice of two ply plastic options including silver and gold. 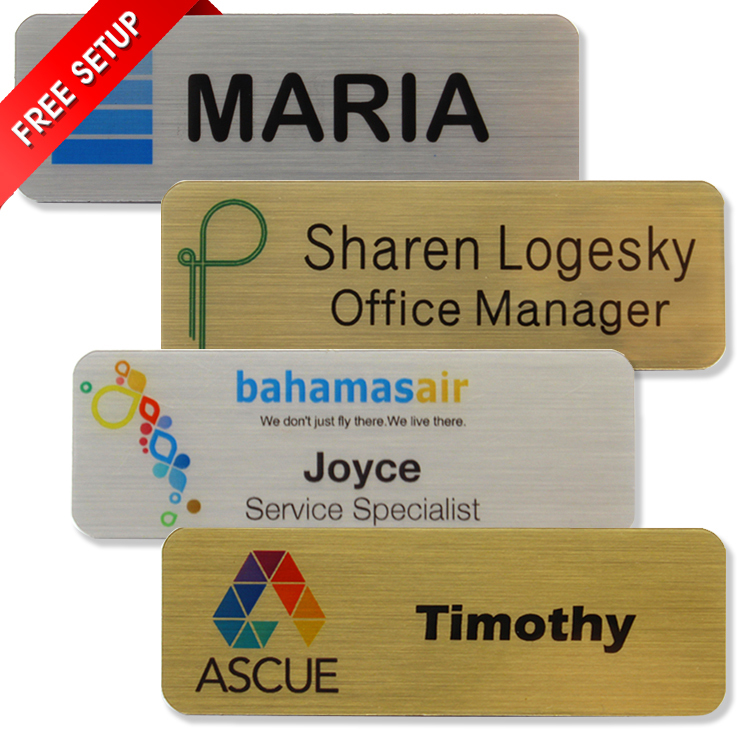 Additional lines of personalization and attachments, including magnet backs, are available at additional cost. 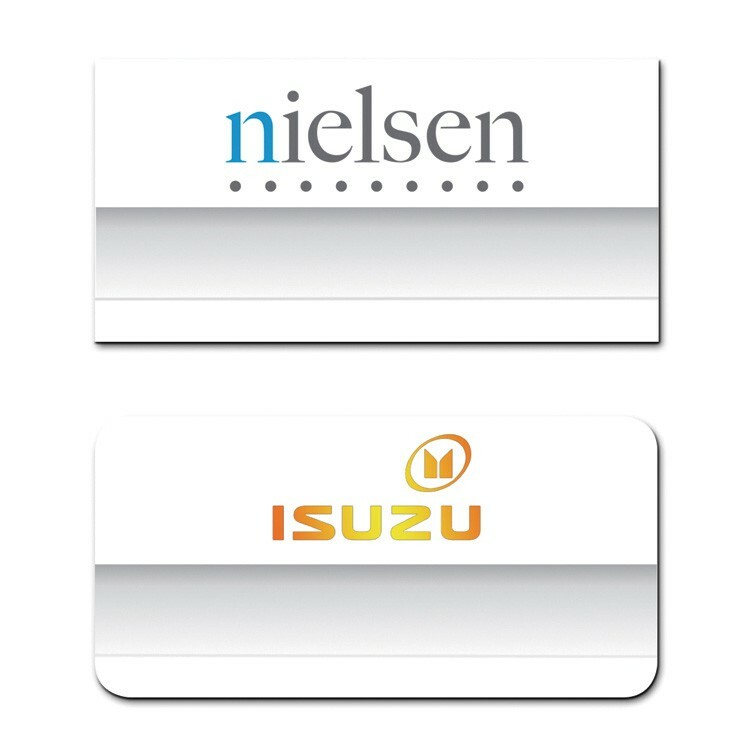 The Vault online release program is available for these badges, allowing you to release personalized badges as few as 1 at a time. 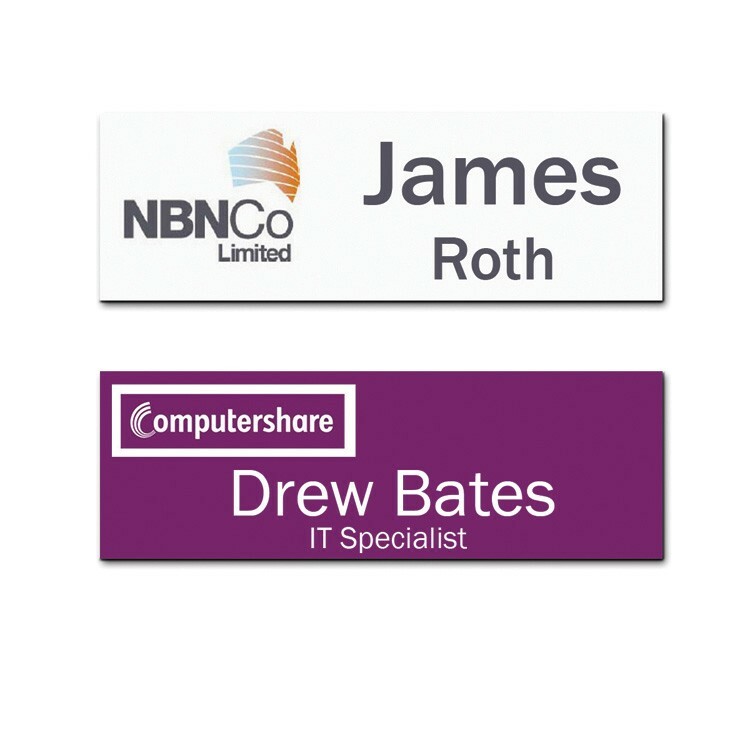 Our Atlas name badge is your solution for a professional full color badge that is perfect for events or normal everyday use! Also great for job interviews, triathlons and witness protection programs! 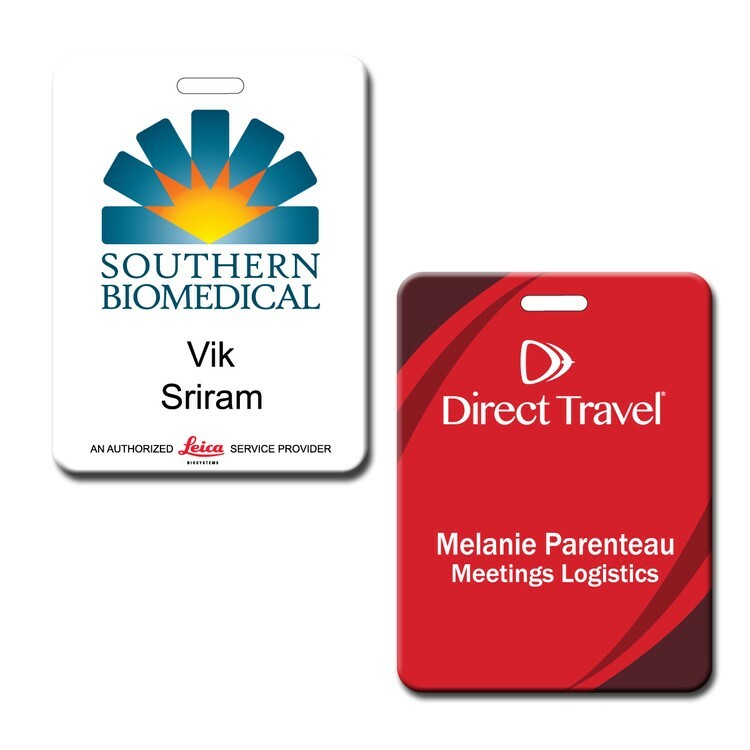 Cost includes digital 4-color process and lanyard in your choice of colors. 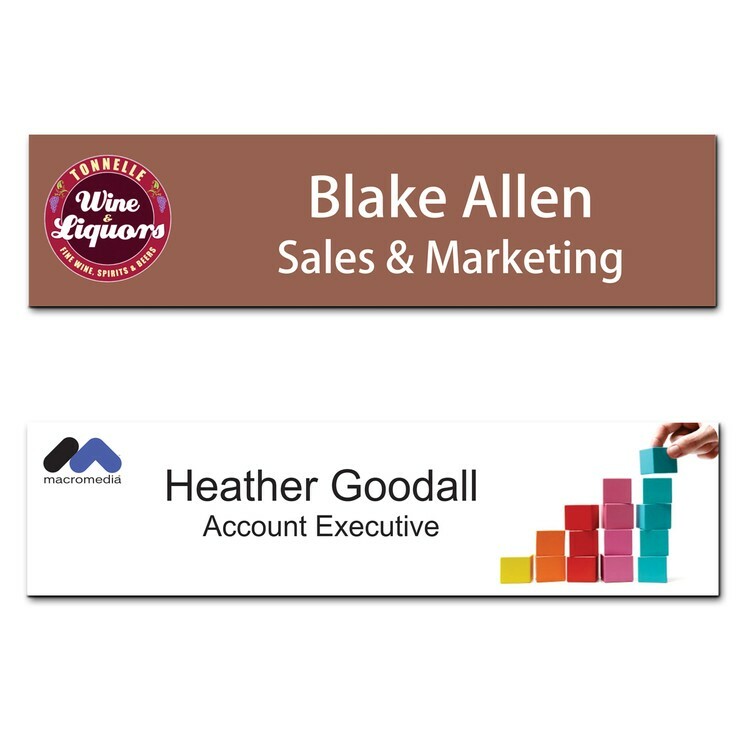 Upgrade to up to three lines of personalization and really jazz things up! 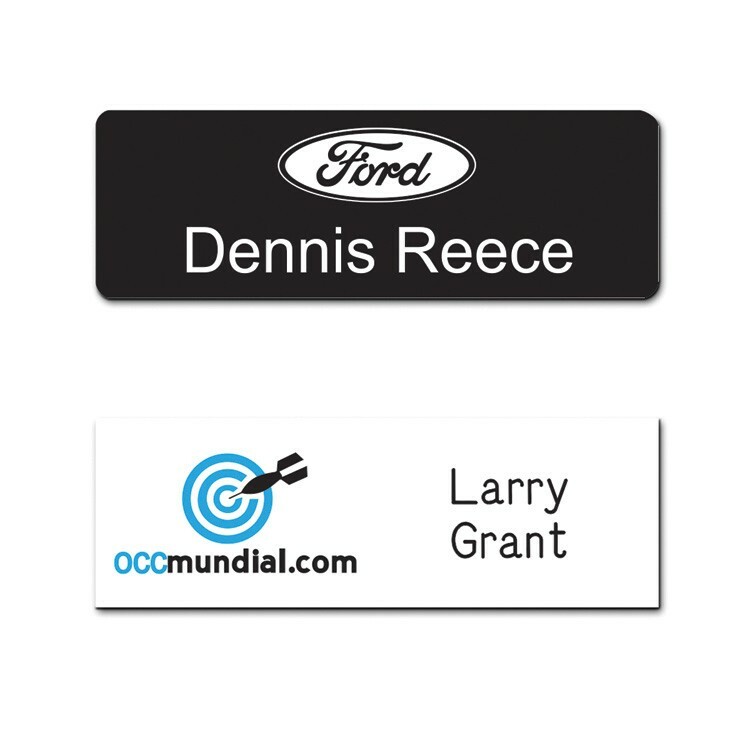 Made from .030 laminated plastic and printed in full color on one side with up to 3 lines of personalized info. Includes an unprinted lanyard. 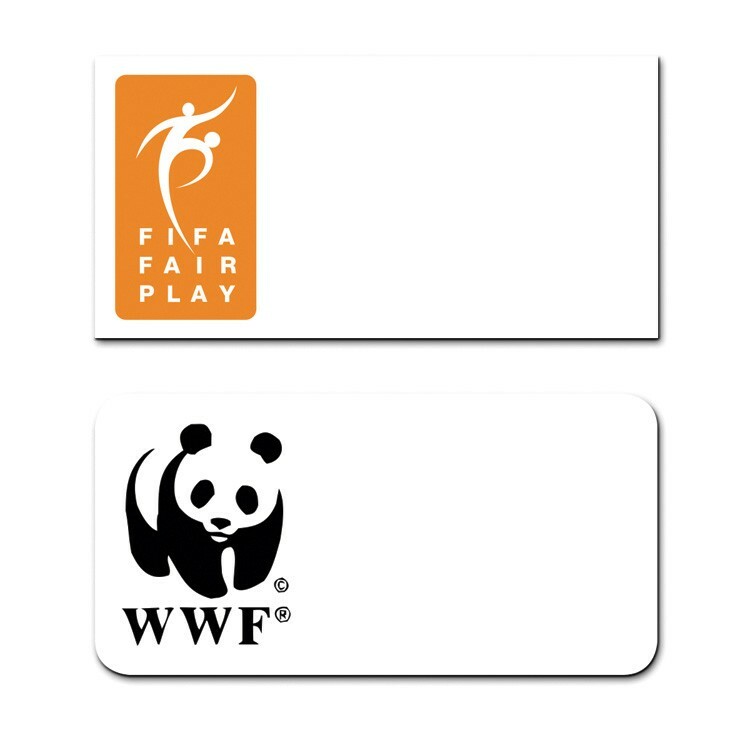 Optional backside imprint is available at an additional cost.